For VHF/UHF FM ham radio use, mobile antennas are whips that are at least a full 1/4 wavelength. You can mount mobile antennas as removable or permanent fixtures. The most easily removed antennas are the mag-mount models, which use a magnetic base to hold themselves to a metal surface. Mag-mount antennas are available from HF through UHF. The drawback is that the installation isn’t as clean as that of a permanently mounted antenna. Trunk-mount antennas for VHF and UHF are semipermanent and look better. Drilling a hole in your car for a permanent mount looks best of all. All three options are fairly close in performance. Whichever method you choose, be sure that you can remove the antenna from the mount to deter theft and for clearance, such as in a car wash or parking garage. You can generally route antenna cables under trim, carpet, and seats. 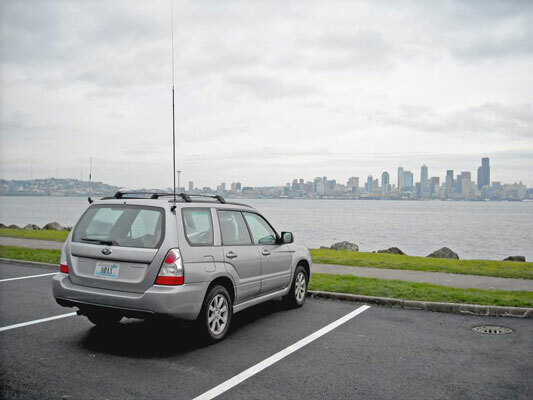 For mobile operation on the HF bands, many hams use Hamstick-type antennas attached to a mag-mount or a permanent mount attached directly to the vehicle. These antennas are wire coiled on fiberglass tubes about 4 feet long, with a stainless-steel whip attached at the top. The antennas work on a single band and are sufficiently inexpensive that you can carry a whole set in the car. They require you to change the antenna when changing bands. Another design uses resonators attached to a permanent base section to operate on different bands. The resonators and fiberglass whip antennas use a standard 3/8-24 threaded mount. An adjustable design that has become popular in recent years has a moving top section that allows the antenna to tune over nearly any HF frequency. Antennas of this type are known as screwdriver antennas because they use DC motors similar to those in battery-powered electric screwdrivers. Hamstick-type antennas are least expensive, and screwdriver antennas are most expensive. Performance varies dramatically, depending on mounting and installation, so guaranteeing good results for any of the styles is difficult. Good results from a mobile station are much easier to obtain on the 20 meter and higher frequency bands. The need to keep antennas small makes operating on the “low bands” (40 meters and below) more of a challenge. At VHF and UHF, portable antennas are very small, light, and easy to pack and carry. At HF, however, the larger antennas are more difficult to deal with. You can try a lightweight wire antenna if you can find a way to support it well above the ground. Trees or lightweight fiberglass masts are your best choices. Vertical antennas need a sturdy base and usually a set of wires to make a ground screen. Telescoping antennas may be options, and you can use the mobile Hamstick-type whips with a few radial wires. An antenna that doesn’t present a low SWR requires a tuner for the transmitter to output full power, adding weight and expense. The smaller coaxial feed lines, such as RG-174 and RG-58, also have higher losses. Try out the performance of your antenna and feed line before taking off on a major adventure to avoid unpleasant surprises.